The Viking lord shield and sword gives you both a weapon and protection for your gladiator or roman themed costume. 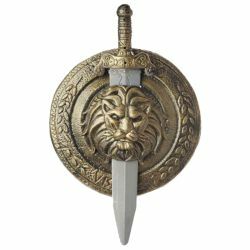 The gladiator combat shield and sword includes a gladiator shield with lion theme and a matching sword that slides into the shield for storage or display. The shield measures 12” in diameter and the sword measures 18” in length.